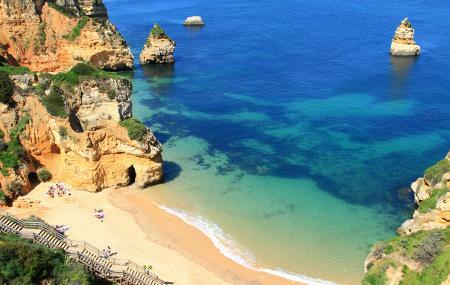 Praia Gale is actually a continuation of the beach at Armacao, about 4km west of the old town of Albufeira. The beach itself is on a small headland, spanning about 5km with a few bars and restaurants. The sand here is soft and golden, very safe for families with young children. The western part is wide and open and walking towards the west features a view of the Nature reserve of Salgados on your right and is great for a quiet walk. At the end you will find charming fishermen boats and then the town and its shops. Walking east will yield a complete change of scenery with more rocky outcrops, amazing rock formation, caves and grottoes that are always a hit with kids and other wielding colourful imagination. This is also a great place to fish from with the cliffs sheltering you to form an intimate cove with natural wind break. Facilities for water sports are available here. Carry sunblock and bottled water. Try going right before sunset, so that you get there when it’s quieter and cooler. You can taxi to and from the old town of Albufeira. How popular is Praia Gale? People normally club together Clock Tower and Zoo Marine Algarve while planning their visit to Praia Gale. People also prefer to start their day with Praia Gale.